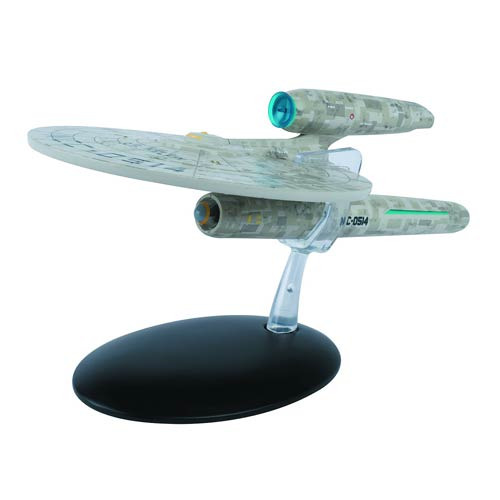 From the Star Trek Official Starships Collection comes the first Starfleet vessel seen in J.J. . Abrams' 2009 Star Trekmovie. The USS Kelvin is the ship where Kirk's father died. George Kirk sacrificed himself to save the rest of the crew. Every detail of this oversized model has been carefully reproduced with reference to the original ILM model. The accompanying magazine includes interviews with the Kelvin's designer Ryan Church and ILM's VFX team and is packed with concept art. Made of die-cast metal. Ages 14 and up.